Complete polishing kits come with everything needed to polish a 20+ foot boat. Get great value & spectacular shine. Available in Basic and Professional versions. We created TotalBoat Boat Polishing Kits to answer the eternal question “What should I use to buff and polish my boat?” We have tested every compound, polish, finishing material, and wax on the market. We’ve tried them on boats from showroom new to hopelessly neglected. We know what works, and what doesn’t. Whether you are attempting this for the first time as a DIY boat owner, or you detail boats for a living, you will find our polishing kits provide superb results while saving time and money. Compounding, finishing, and waxing your hull with everything in the Professional kit produces high-gloss, lasting results that look like you had it done by boatyard professionals. The Basic kit restores hull color and removes the oxidation that dulls and fades finishes. Both include our premium wax to ensure lasting shine. 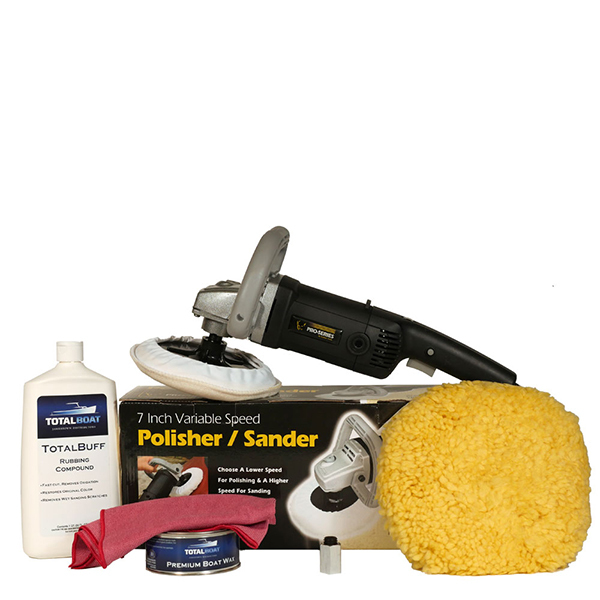 Both kits include a powerful, variable speed polisher, polishing pad, adapter, and cleaning cloth. The Professional kit adds our high-gloss finishing compound, plus protective gloves and eyewear. Purchased separately, the items in either of these kits would easily add up to more than $270. 1 bottle of TotalBoat TotalBuff Rubbing Compound, 32 fl. oz. 1 can of TotalBoat Premium Boat Wax, 11 oz. 1 bottle of TotalBoat TotalShine Finishing Compound, 16 fl. oz.